I just returned from celebrating NFPW’s Communicator of Achievement nominees. The awards ceremony is always humbling. I am in awe of all these accomplished women have achieved. Whether they are covering stories in their hometown or in far-off lands, or they are handling the latest PR crisis, they have raised the bar in the communications profession. The Communicator of Achievement Award is the highest honor bestowed by National Federation of Press Women upon those members who have distinguished themselves within and beyond their profession. The recipient, chosen from nominees selected by state affiliates, is recognized for exceptional achievement in the communications field, service to NFPW and to the community. This year’s winner is Karen Stensrud of North Dakota. Her writing career established her as a recognized business and community leader, and a mentor to others in communications. While finishing a master’s degree in creative writing, Stensrud started Words That Work, a business that put its stamp on the communications of more than 70 organizations. 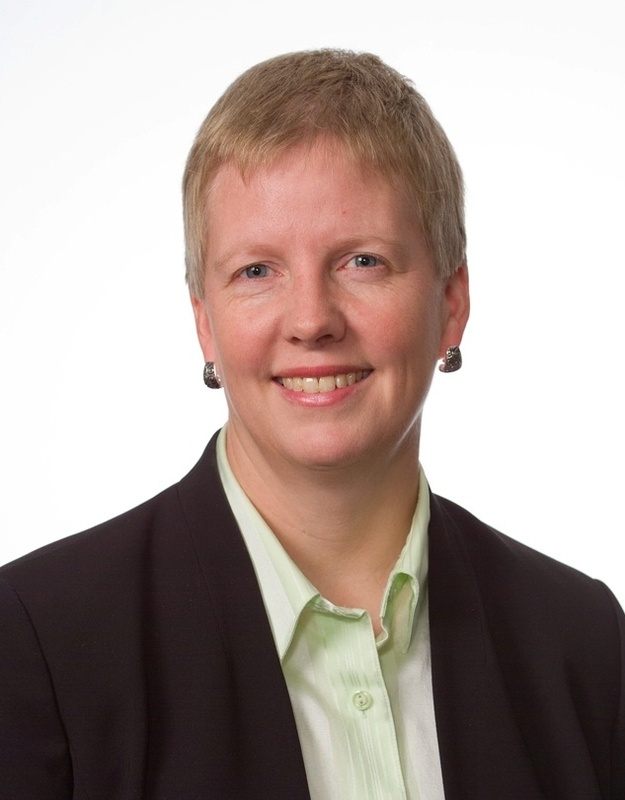 Hired as State Bank & Trust’s vice president of marketing and communications in 2004, Stensrud has overseen the bank’s marketing through continued growth. Stensrud served three consecutive terms as president of NDPC and has won many state and national contest awards. She is in her third year as an NFPW Education Fund board member and co-chair of NFPW’s high school contest. A strong community volunteer, Stensrud co-founded the Women’s Business Exchange, providing education and mentorship for business women. She is also in her second year as co-chair of the Women’s Fund, a permanent endowment to improve the lives of women and girls. NFPW’s COAs are to be admired and emulated. In this day of everyman as journalist — thanks to blogging — ethics are more important than ever. During the NFPW conference, members recited the NFPW Code of Ethics. It’s a good reminder of our responsibilities. As a professional communicator, I recognize my responsibility to the public which has places its trust and confidence in my work, and will endeavor to do nothing to abuse this obligation. With truth as my ultimate goal, I will adhere to the highest standards of professional communication, never consciously misleading reader, viewer, or listener; and will avoid any compromiste of my objectivity or fairness. Because I believe that professioanl communicators must be obligated only to the people’s right to know, I affirm that freedome of the press is to be guarded as an inalienable right of the citizens of a free society. I pledge to use this freedom wisely and to uphold the right of communicators to express unpopular opinions as well as the right to agree with the majority. NFPW’s retired members spoke, and we listened. In an effort to clean up and streamline the NFPW bylaws, the board suggested that retired members should not be able to participate in the communications contest. If they wanted to participate, we thought they should do so at the full member rate. We didn’t realize how important the contest was to our retired members. Frankly, we didn’t consider that retirement today does not mean what it did 30 years ago or even 10 years ago. Many of our members continue to work in some capacity (but not full time) and want to be recognized for their work. A valid point. We heard you. Our retired members will continue to have the right to enter the communications contest. We did eliminate the emeritus designation because it was confused with retired. We also eliminated the corporate designation. And we added in that out publications are both printed and electronic. Thanks for speaking up! Our members always have been vocal. That’s why NFPW continues to thrive. When I ran for president of NFPW, my campaign slogan was SNAP! which stands for Sustainability, Networking and Professional Development. Today I reported out on this board’s first year together. For those of you who couldn’t be in Chicago, here’s an update. Sustainability: We continue to recruit members, and membership remains our heavy focus. During this year’s conference we’re pairing first-timers with veteran conference attendees so that first-timers can get their questions answered and more easily network. Despite the harsh economic climate, NFPW ended the year in the black! The board is looking at additional revenue streams. We also renewed our contract with American Press Works, which held its fees to last year’s levels. Networking: We’ve established a presence on several social media platforms, including LinkedIn, Facebook and YouTube. We stay in touch through the quarterly Agenda (I hope you’ve checked it our recently. Linda Koehler and Teresa Ford are doing a fabulous job with it!) and through a monthly e-letter. The emphasis at this year’s conference is about Face 2 Face communications. One of my goals is to reach out more frequently to the affiliate presidents so that we can all learn from each other. Professional Development: During the meeting I unveiled the new NFPW website, which is designed to be more news and member focused. It will be live within 30 days. We posted numerous business tools to the website, including templates for business cards and letterhead. I’ve been sharing communications trends, tips and happenings through this blog. I hope you’ll encourage others to read it. Other highlights: The NFPW board met in New Mexico as the guests of the New Mexico Press Women. We were able to celebrate their 60th anniversary with them. Here in Chicago we’re celebrating the 125th anniversary of our founding affiliate Illinois Woman’s Press Association. Congratulations! So now it’s time to SNAP! Forward for the next year. We’ll continue to grow our membership. I’m visiting affiliates when asked and schedule permitting. I’ll represent NFPW at the Councail of Journalist Organizations this fall. And we’ll keep reaching out through LinkedIn, Facebook and the blog. I hope you’ll continue the journey with us! 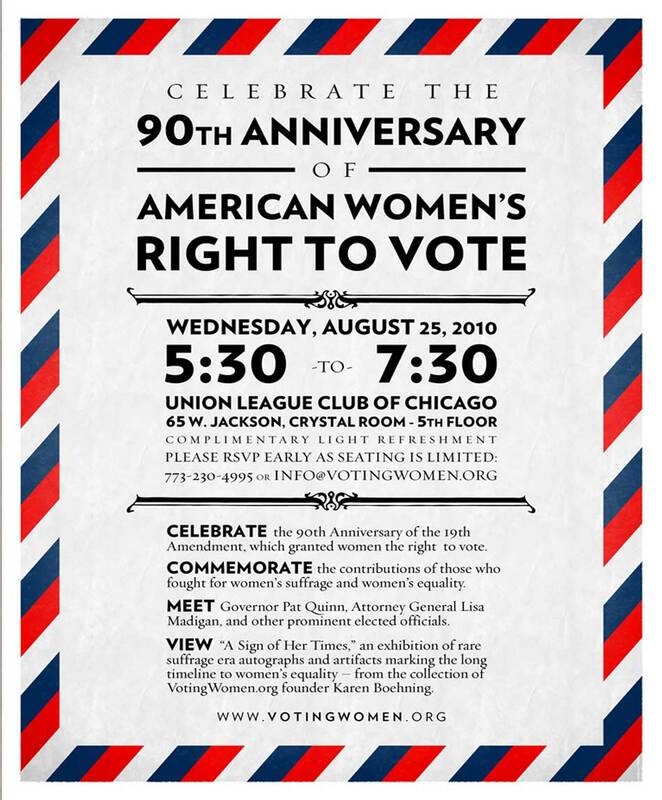 Today I had the honor of attending a reception with the Illinois Governor Pat Quinn and Illinois Attorney General Lisa Madigan to mark the 90th anniversary of women’s right to vote. It is fitting that the reception is at the Union League Club where NFPW members are gathering for the annual conference. This year also marks the 125th anniversary of the Illinois Woman’s Press Association. Many of the early members of this affiliate were active in the suffrage movement. American women risked it all — including their lives — to secure the right to participate in elections. The 19th amendment guarantees women the right to vote in all public elections. To learn more about mobilizing female voters visit www.VotingWomen.org. You can also learn more by reading and viewing works by NFPW member Paula Casey. Her book, “The Perfect 36: Tennessee Delivers Woman Suffrage” and the DVD “Generations: American Women Win the Vote” both capture pivitol moments in women’s efforts to guarantee their right to vote. The NFPW conference is later this week in Chicago. I have eagerly anticipated this conference from the moment the Illinois Woman’s Press Association presented at the Texas Conference. I’ve always loved Chicago. Combine that with getting to see old friends and new friends, the networking, the seminars and yes, staying at the number one city club in the United States, it was hard to contain my enthusiasm. I actually started tiny piles of items to bring with me more than a month out. If you know me, I’m the type to pack the evening before or evening the morning of so clearly I couldn’t wait! 1) Chicago-area artists have turned old refrigerators into sculptures that now line the city’s popular Michigan Avenue, a.k.a. the Magnificent Mile. Why? For one reason, to help promote local efforts to recycle unneeded refrigerators and freezers. For another reason, Chicago has a history of loving offbeat art projects. For a sneak peek before you get the chance to see the funky fridges, take a look at Time Out Chicago’s Fine Art Fridges photo gallery. 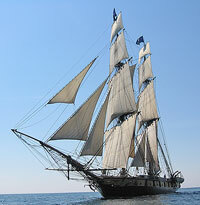 2) During our time in Chicago there will be 20 historic ships from around the world coming to Navy Pier. Visitors can view the ships, board them or take short sails (tickets required). During the 1880s, Chicago was the busiest port in America. To find out more visit www.navypier.com/tallshipschicago. 3) Bring comfortable shoes with you. The Union League Club is located in the heart of what is known as “The Loop” and within walking distance of many of Chicago’s architectural treasures, including Millennium Park and Lake Michigan. 4) Bring business cards. This is your opportunity to network. If you don’t have business cards, make the small investment to print your own. You will want to share your contact information, I guarantee it. Remember to follow up with those business cards you receive in return. Check LinkedIn.com for the NFPW group and be sure to add it to your profile. 5) Ask questions. The NFPW board as well as members of the Illinois Woman’s Press Association will be in attendance. 6) Don’t wear your badge outside the conference facility. People outside of the conference don’t need to know you’re business. According to a Wired report the average web surfer sees 490,000 words a day online. To put that in perspective, Tolstoy’s “War and Peace” had 460,000 words.